There are so many different monsters to dress up as for Halloween, but how could one ever decide? Well, we think that this amazing deluxe costume will help your kiddo lock in a decision. Once he lays his eyes on this stylish gothic outfit he will surely want to be nothing but a vicious vampire! Grab your youngster this Boy Child Deluxe Vampire Costume and watching him transform into one of the mightiest creatures of the night. Some would even consider the Vampire species the masters of the night. So easily do the prey on the warm-blooded wanderers in the night. Sure, they must stay in a dark abandoned castle while the sunlight curses the earth with its unbearable rays, but as soon as the moon is lord of the sky, none can go head to head with the vampire. Zombies are nothing more than laborers, werewolves are merely pets, and mankind is a buffet waiting to be feasted upon! 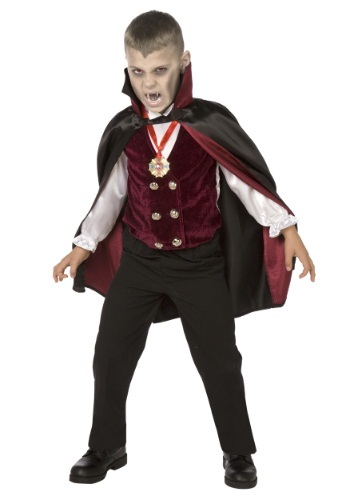 Now then, this costume comes with just about everything your little one will need to join the ranks of the most elite vampires. Although a fine velvet vest, a high-collared cape, and some sleek black pants will only get your youngster so far. Look through the rest of our accessories to find the perfect additions to this costume. We would suggest a set of fangs to toss in his mouth as well as one of our vampire pendants. A quick makeover to get rid of the fleshy color the covers his face should complete this supernatural transformation. Before you know it, he’ll be leading his very own vamp nest into the night for some tasty treats and savory sweets!